Is there a Small Modular Nuke in our Distributed Energy Future? Fully‐burdened cost of fuel in Iraq typically $5‐30; as high as $400 reported in Afghanistan. Security for supply convoys in Iraq required an average of 1 FTE combat battalion on a continuing basis (2009 estimate). Ground resupply has accounted for over approximately 35% of US casualties in Iraq. Winter resupply in Afghanistan takes up to 45 days from supply source to end user. What the US military needs according to Colonel Roege is clean, modular, transportable energy sources for forward operating bases, the lift to get them there and move them around, and a fast-track path to development and commercialization to supply them anywhere in the world. This Army Colonel said the US military already has a solution in mind based upon the experience of the US Navy. That solution is small scale, modular nuclear power plants like the ones used on aircraft carriers and submarines. Only the new version would be likely smaller, more portable and safer by design with passive safety systems. The Colonel says the military does not believe the NRC will license such a modular design anytime soon enough to meet the military need so he is recommending that the Department of Defense use its authority to license such technology for military purposes since doing so does not require NRC approval. Once proven and deployed, these military applications should speed the path to small modular nuclear units in civilian applications. Speeding the development of transportable, small scale, safe microgrid solutions based upon small modular nuclear plants could transform the power system not just for the US military but for civilian applications as well. By substituting the economies of scale from modular design for the economy of scale from building large sized nuclear plants as was done in the first generation nukes, the hope is that nuclear energy will find a larger market share place in our clean energy economy. It may not be the fuel cell alchemy the military would love to have, but it is technology the military knows made better, safer and, they hope, cheaper by modern design and manufacturing methods. Transforming our energy future with clean, sustainable, low emission choices is the goal of much of our energy strategy today. In a distributed energy future we need more choices with greater efficiency than currently available from wind and solar. Small modular nuclear reactors meet that need and give both our military and potentially, a wide range of civilian applications the best available technology with the capability to displace coal and replace the first generation nuclear units as they retire. 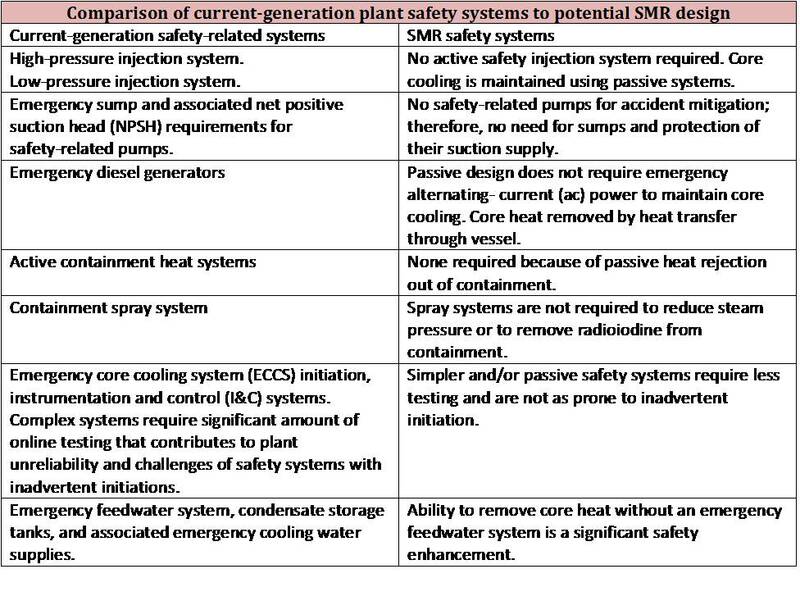 According to the World Nuclear Organization, in 2010, the American Nuclear Society named a special committee to assess licensing issues with SMRs in the United States. The committee is reviewing the experience from dozens of land-based small reactors were built from the 1950s to 1980s primarily for military or research purposes. The committee included more than 50 participants including the NRC, SMR proponents, Department of Energy laboratories and universities. 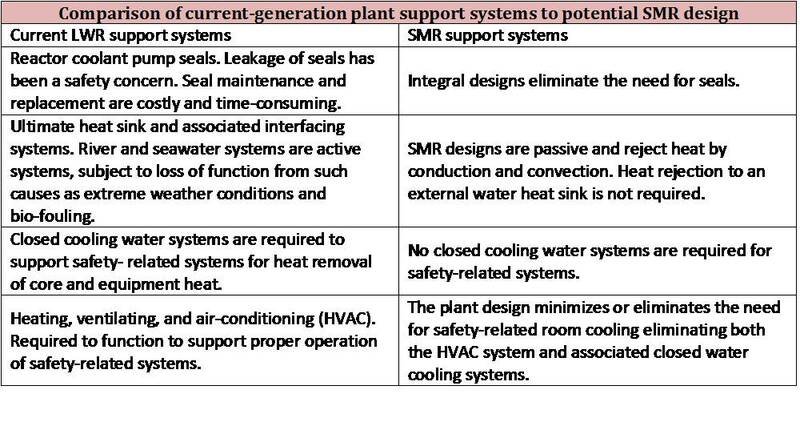 The committee’s interim report presented two tables to summarize and highlight differences between the existing US reactor fleet and Small Modular Reactors that summarize the benefits to the military and the rest of us. During the thirty year 1950-1980 period the US produced eight small power reactors with autonomous power sources that did not require continual fuel delivery in sizes ranging from 0.3 to 3 MWe for use in remote areas of Alaska, Greenland and Antarctica. Russia built as many as 20 such small nuclear power plants so the technology is not new. What is new is the rethinking of the potential for small modular nuclear plants for use not only in military applications but to make a distributed energy resources solution practicable in our clean energy future. This entry was posted in Electric Power and tagged American Nuclear Society, DER, distributed energy resources, energy, Environment, microgrids, Nuclear, nuclear power, Nuclear Regulatory Commission, SMR, technology, United States. Bookmark the permalink.